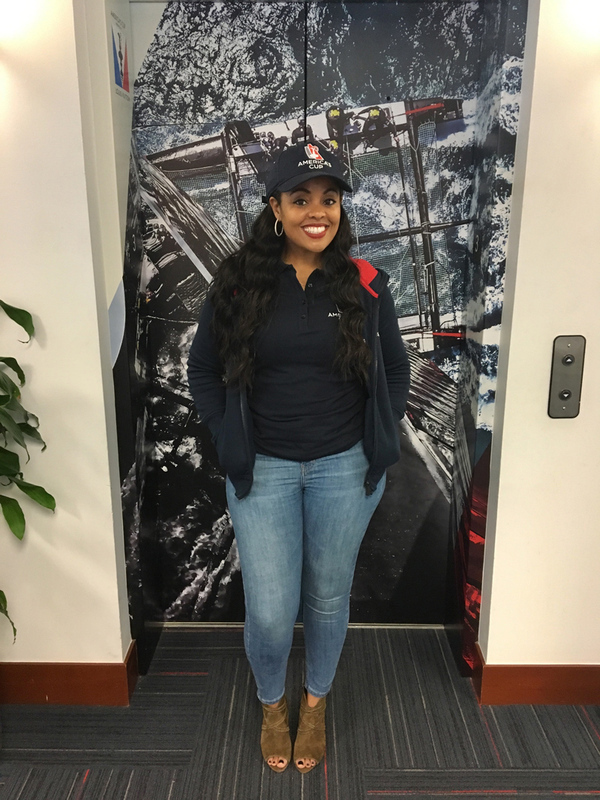 Sancha Durham is the Events & Business Support Coordinator for the America’s Cup Event Authority. [ACEA]. She was the first Bermudian hired by ACEA back in March 2015 as the Office Manager, but later promoted to her current role working closely with Sir Russell Coutts and his Personal Assistant, Alejandra Mato. Ms Durham’s responsibilities include the sourcing and scheduling of all Local Talent, Development of The Band, inventory control, distribution of all uniform within the America’s Cup and supporting Sir Russell and his PA with business matters. Here, she tells us more about her role. 1] What does a normal day look like for you working at ACEA? There is no “normal” workday for me working at the ACEA and that is what I love about it! I am involved in so many different components that there is never two days alike, which keeps me ticking and keeps me on my toes. 2] What sort of opportunities have you had through this position? I have had the opportunity to advance within the company. I can officially say that I was the ACEA’s first hire, starting in March 2015. When I started, I was offered the position of Office Manager. Although I knew that Office Manager was not what I had in mind, I knew by taking it I would have my foot in the door. All I had to do was to show them that I was capable of taking on a role where I was truly involved locally, on the frontline. By January 2016 I was promoted into the role that I truly wanted, Special Events and Business Support. 3] How does it feel working for a global organization? I have met some truly amazing people with a wealth of knowledge and experience. It keeps me ambitious. I can see where I am constantly growing. It excites me to think what could be next. The possibilities are endless. 4] What is your responsibility for the Louis Vuitton America’s Cup World Series events worldwide? Initially it was my role to make sure that all flights, accommodations, ground transportation, visas and accreditation were taken care of for each event. I have now moved over to working with the VIP’s at the Louis Vuitton America’s Cup World Series events. 5] What is the best part of your job? The best part of my job changes daily, but as of today I am extremely excited for the projects that I am working on for 2017. I am responsible for all Local Talent and Special Events for 2017. I wake up daily and work towards making the America’s Cup 2017 more special and memorable then the last. Being a Bermudian born and raised, it is an honour to be a part of this prestigious organization. Amazing job Sancha always been a role model for me personally. love that you are doing amazing things! Keep it up!! Sounds like you are having a blast! Well done. Well done young lady. The experience will serve you well for many years.